On Sunday, March 3rd, MCA of Chicago will be hosting members and guests at Sloan Park for a “cross-country classic”—the Chicago Cubs and the Chicago White Sox will be playing each other in a spring training game! No matter your team, show some Chicago spirit by planning to arrive in Phoenix early on Sunday (game time is 1:15pm). Stay tuned for more information on this event! 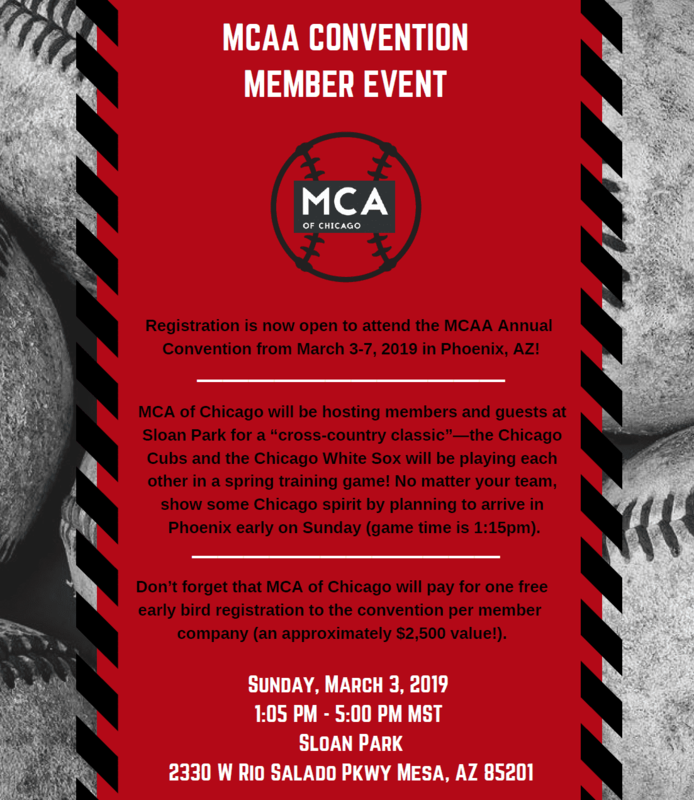 Registration is now open to attend the MCAA Annual Convention from March 3-7, 2019 in Phoenix, AZ! Find out more, including a speaker lineup, hotel information and how to register at MCAA’s convention website. Don’t forget that MCA of Chicago will pay for one free early bird registration to the convention per member company (an approximately $2,500 value! ).